PAT Fenlon used to make the pilgrimage over the Irish Sea as a boy to watch boyhood heroes Celtic with his dad. But the Hibs manager is now prepared to risk the ire of family and friends as the Leith outfit bid to halt the leaders’ remarkable 17-match domestic winning streak when they come calling to Easter Road tomorrow. The demand for tickets and interest has made Fenlon realise this is more than just another game on a personal level. But the Dubliner – who admits he idolised Kenny Dalglish as a kid – would take no greater satisfaction that seeing Hibs rein in Neil Lennon’s seemingly impregnable Celtic team. Fenlon said: “Everybody in Ireland has an affinity to Celtic and that’s just the way it is, it’s just my club. My father Pat was a Celtic fan and like most people, it goes down through generations. “My dad was a football man, he liked Preston North End and Celtic was his team in Scotland. “Growing up in Ireland at that time there was probably only Liverpool and Manchester United, and Celtic was the only Scottish team. “You didn’t get any matches on TV, you had the papers and you got a glimpse of the Scottish Cup final after the English Cup final until the 90s, when they started showing more games. “I’ve not seen Celtic much at all over the last few years, probably once in the last three years. “Previous to that I was coming more although it’s difficult when you’re playing and managing as well,” added the former Bohemians manager. 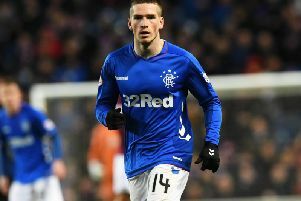 Fenlon, whose side have renewed confidence following a productive January transfer window and the fact they recorded successive clean sheets for the first time in a year, added: “I’ve got a few friends coming over and a few coming through from Glasgow so it should be interesting on Sunday evening. “Hopefully I can rub their noses in it a little bit after. There is a bit of interest in it, more than normal. “There is plenty of interest back home, it’s probably a chance for me to show what I’m doing but I’ve not looked at it that way. “It would be nice for people to say ‘he’s over there doing a decent job’ after Sunday if we get a result from the game. The Celtic fans are sure to be in celebratory mood on Sunday regardless of the result after watching their side stride 14 points clear at the SPL summit after Rangers were hit with a ten-point penalty for plunging into administration. Hibs were in fact the last team to take points off the Glasgow club back in October. “Celtic began their run after we played them and hopefully we can end it,” added Fenlon. “To go that many games unbeaten, and just winning is phenomenal. Fenlon was at Bohemians when the Irish club’s financial woes started to mount and has sympathy for those affected by the crisis at Rangers. He added: “I think with the game we’ve got it is probably a little bit harsh for me to talk about anything else. “I feel sorry for the people that are employed by the club because it’s a difficult, difficult time.